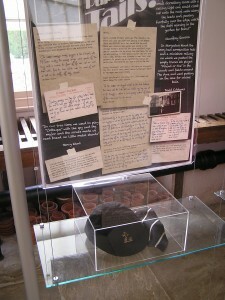 Earlier this year the National Trust mounted a splendid exhibition in the Stone Gallery at The Vyne. 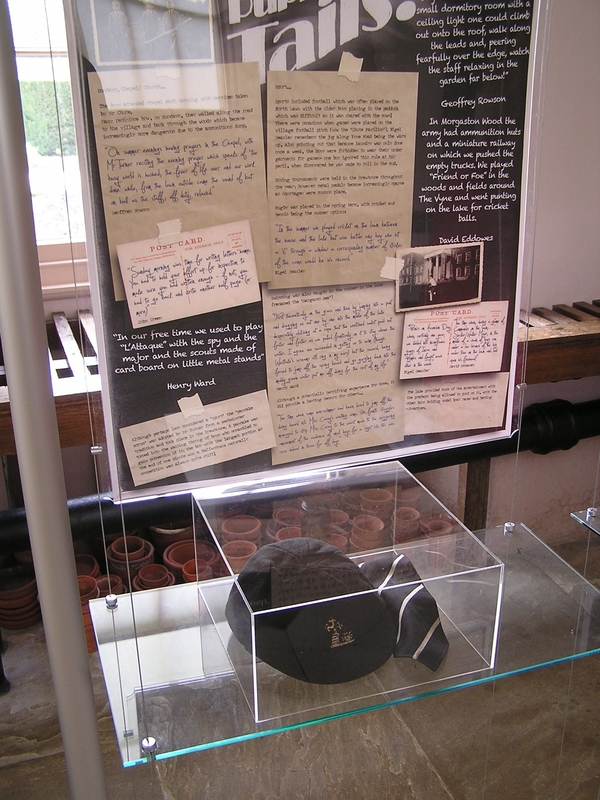 Slugs, Snails and Puppy Dog’s Tails documented the wartime occupation of the house by Tormore School, a preparatory school evacuated from East Kent. The story was of particular interest because I had three cousins (including two of the evacuees), an uncle and a brother at the school, and attended it myself in the 1970s. The dining room at Tormore was adorned in my day by two large engravings of The Vyne (identical to those now in a passageway of the house) to remind us of the association. Every boy knew that F.G. (‘Fidge’) Turner, the redoubtable former headmaster and proprietor of the school, had served with Charles Chute, owner of The Vyne, during the Great War. Turner (educated at Westminster and Cambridge) was a Captain in the Dorset Regiment. Chute (Eton and Cambridge) served in a Public Schools Battalion and, like Turner, was awarded the Military Cross. 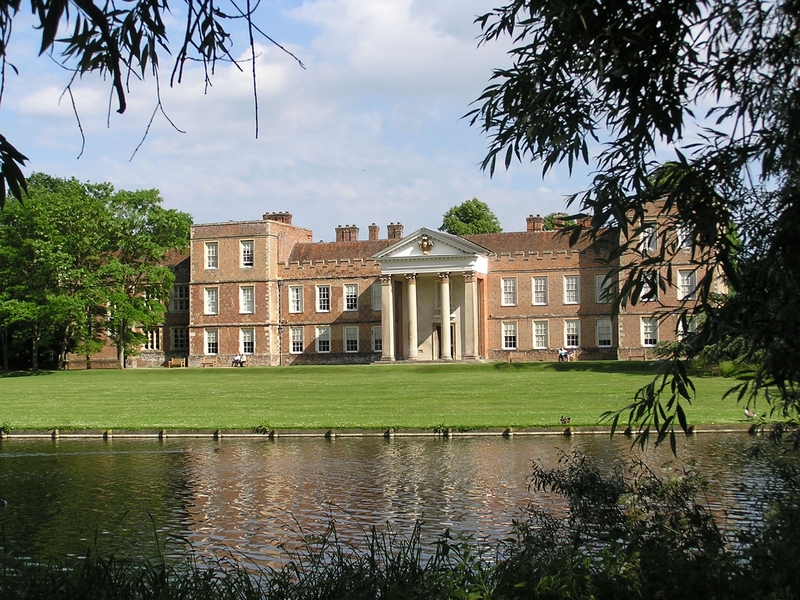 It seems that Turner had raised the possibility of evacuating his school to The Vyne in the event of a future war, to which Chute had readily agreed. Tormore’s location in East Kent, at Upper Deal, had been vulnerable at the time to Zeppelin attack. When German bombing resumed in 1940, Turner, by now an experienced headmaster, renowned for churning out record numbers of scholars and exhibitioners at leading public schools, took characteristically decisive action. On 17 May, the entire school, consisting of teaching staff and sixty boys, with bedding and other furniture, pitched up on Chute’s doorstep. They had travelled for ten hours in a pair of buses, picnicking on Reigate Heath on the way. ‘Hitler will never find you here,’ the disorientated driver had remarked as he negotiated the lanes to their final destination. Chute was equally bemused. He had been given two days notice of their arrival and – so I have been told by his relative, Francis Chute – had forgotten all about his earlier promise. Lessons were resumed at noon the following day, mostly in the Stone Gallery, though younger boys were taught in the Tapestry Room and Further Drawing Room. The Tormore dormitories, all named after imperial heroes, were reconstituted in rooms upstairs – Wolfe, Kitchener, Clive and Nelson in the Oak Gallery; Drake, Roberts, Gordon and Wellington in the East Tower. Each boy had his own chamber pot and was entitled to a single bath per week. The normal routine of the school was replicated as closely as possible. The boys assembled twice a day for prayers in the Chapel, with Chute himself (‘very churchy’, according to Francis) conducting the morning service. The Brewhouse was used for choir practice, gym and boxing, and also for the annual ‘Pancake Scrum’, a Westminster tradition, in which the tougher boys attempted to seize the largest portion of a pancake for a prize of half a crown. Turner, who was notoriously strict, set up his study in the Print Room, where he kept a selection of canes in an umbrella stand. Like all schools in the war, Tormore was rapidly drained of its younger, fitter male staff, who were replaced by injured or elderly men, or by women. Some of these were decidedly eccentric. Miss Hassard was an ardent communist who taught the boys Soviet propaganda songs. It is hard to believe that Turner would have approved. There was a Miss Carey, who sounds a rather spiteful woman. She received her come-uppance during a swimming lesson in the lake, when she lured a terrified non-swimmer off the diving-board into her waiting arms. ‘His frantic struggles managed to strip Miss Carey to the waist, much to the amusement of the audience of small boys.’ The beautiful Miss Longuet-Higgins (daughter, I presume, of the Vicar of Lenham, near Ashford, and sister to two distinguished scientists), was, on the other hand, much appreciated for her charms as well as for her skills as ‘a demon fast bowler’. She left after a couple of terms, but not before a gallant Secker-Walker ma. had presented her with a Valentine’s Card ‘on behalf of all her admirers’. Food became an obsession among boys whose morning staple was ‘tepid lumps of plaster in a sickly gruel that passed for porridge’. It was noticed that the staff enjoyed thinly-cut slices of bread with butter and marmalade for their breakfasts, while the boys had to make do with thinly spread margarine and barely perceptible quantities of jam. For lunch they were regularly treated to ‘spinach floating in water and smelling of manure’. There were instances of the staff pilfering the treats that had been sent to individual boys. At least they could count on their ‘tuck’, an allocation of boiled sweets, for which they had to queue up in alphabetical order. Some hungry boys resorted to desperate measures: ‘I. Welchman is said to have eaten a slug whole and raw,’ reported a gleeful Secker-Walker to his parents. There was, however, seemingly endless space in which to roam, one old boy stating that, in spite of the hardships, he ‘loved the Vyne with the same intensity that I hated Upper Deal’. In Morgaston Wood, there was even the thrilling spectacle of an army ammunition dump. The boys were constantly exposed to the realities of the war. In the Chapel on Sunday evenings, they would occasionally sing a hymn chosen by a boy whose father had been reported missing or killed. There was an incident in which the aptly named Slaughter ‘walked into the staff room with an unexploded incendiary bomb’. The excitement was palpable in the build-up to D-Day. Whilst the boys were waiting for a train at Basingstoke Station at the end of term, ‘a train full of G.I.s pulled in on the opposite platform and we were showered with bars of chocolate’. On 6 June 1944, the boys saw the sky ‘filled with planes’ as the American airborne troops took off in their gliders from Aldermaston airfield, the first wave of the invasion. However, it was not until the end of the Easter Term 1945 that Turner considered it safe enough to return to Deal. Chute counted himself lucky to have been spared the destructive presence of the army. It struck me while viewing the exhibition that the school had barely changed at all by the time I attended it in the 1970s. It still occupied its original premises – a Georgian mansion on Rectory Road, Upper Deal, with converted stables and outbuildings and, I think, thirteen acres; also The Court House, The Old House and The Yews nearby. 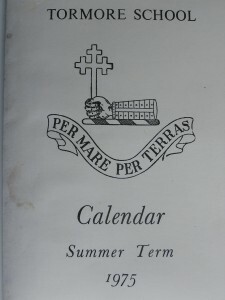 The uniform – grey shorts and jersey, black and white tie and cap – was certainly identical; so were the names of the dormitories and of the school houses – Tanks, Terriers, Torpedoes, Tigers and Tadpoles (I was in Tanks); the daily routine (with morning and evening prayers held in the ‘Mem’ Room, a dignified shrine to the school’s casualties in both World Wars); even the annual ‘Pancake Scrum’ held in the school gym. 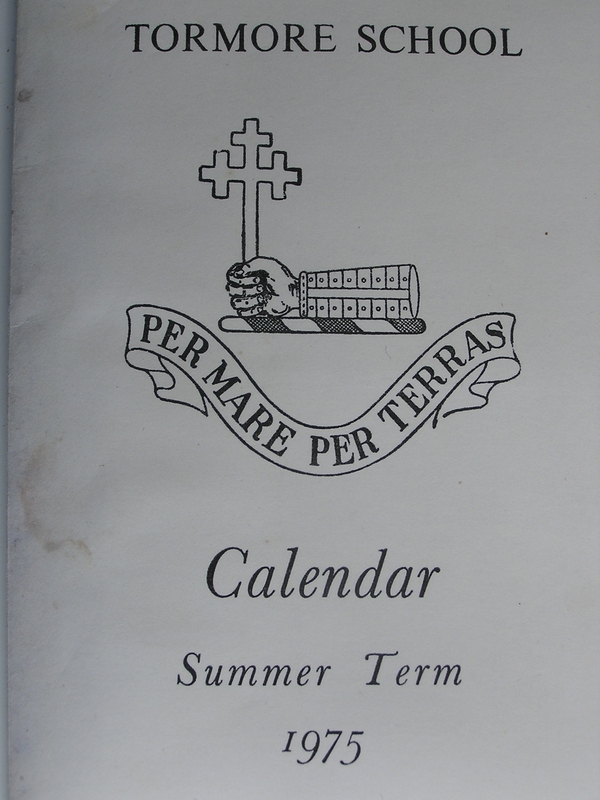 There were also the weekly distributions of ‘tuck’, for which we still had to queue up in alphabetical order, an arrangement considered most unfair by those whose names began with W.
Turner was still alive and his influence was still felt in the school, though he had retired in the 1950s. I remember him well. Members of Tormore ‘dynasties’ like myself were invited once a term to take tea with him and his wife, a dapper, diminutive couple, at Orchard House in Deal. One was on one’s best behaviour and conformed to a strict routine. After games of bowls in the beautiful garden we would launch ourselves on a lavish tea. Mr and Mrs Turner – he was always immaculate in a three-piece suit and tie – would ask after the health of my grandmother. A fulsome ‘bread-and-butter’ letter, strictly vetted by the current headmaster who was on his best behaviour as much as we were, would be composed that evening, ready for prompt dispatch the following day. It would astonish modern prep school children to know that we were still served the same lumpy porridge for our breakfasts (with brown sugar and milk) as our wartime predecessors. Each loaf of sliced bread would be served repeatedly until finished, although the stale left-over slices, identifiable by their curling edges, would sometimes reappear in the sickly-sweet bread-and-butter puddings with which we were also regaled. I shudder to think of them. We were consistently underfed. As far as I remember we also had only one bath a week (or no more than two) though we were required to wash ourselves daily, queuing up in our underpants to use the washbasins, our efforts being vigorously inspected by the fearsome Matron, Miss Edith Gardiner. This harpie, sometimes kindly, sometimes manically hysterical, would twist our limbs agonisingly in order to inspect every corner of our bodies, and occasionally apply a scrubbing brush or pumice stone to those who had, in her opinion (which varied according to her mood), failed to wash themselves properly. Those of us boarding in The Old House, as I did for a term (it was run by a sad, bibulous widow, Mrs Alcock ‘and no balls’, who reeked of sherry and occasionally sprouted a black eye), depended on hand basins, which one of us had to fill from a jug of water that had been boiled downstairs. The central heating at Tormore consisted of hot pipes around the skirting board, exactly like those in the Stone Gallery at The Vyne, on which the prefects were allowed to scald the hands of recalcitrant younger boys. There was none of that in my day: the pipes were rarely turned on, and it was punishment enough to be freezing cold all winter. I do remember that the cane was retained in the headmaster’s study as a constant threat. I never received it myself, though I was ‘slippered’ on at least one occasion (when, as the senior boy in ‘Drake’, I was the scapegoat for the whole dormitory during a rowdy ‘midnight feast’). Such punishments may have been character-building, but they are now illegal. I remember with horror having to go out for ‘Games’ on freezing winter days, sometimes, it seemed, in raging blizzards; chapped legs and chilblains were endemic. As my brother remarks, there is no hardship he cannot face after Tormore. It was certainly a Spartan institution, in a bleak, remote, windswept setting. Boarders at the school were no better off than prisoners, confined for weeks on end to its four walls, and probably with fewer comforts. I rarely saw my parents in term-time and was constantly homesick, which amounted to prolonged trauma for a child. However, I think of Tormore with great gratitude and affection for the skill and commitment of the masters and for the first-class education that they provided. I think particularly of my last headmaster, John Hare (an old Tormore boy himself, then Repton and Brasenose), who began gradually to modernise the school. His last job had been at Millfield. I was delighted by one of Hare’s early pronouncements, on ‘tuck’ day: ‘The distribution of sweetmeats will be conducted in reverse alphabetical order’. His beautiful wife ‘Mo’, known as ‘Nefertiti’, made many improvements to the menu, even introducing egg and chips as a Saturday evening treat. Hare was a rigorous, gifted teacher, whose lessons were exciting and challenging. He and characters like Myles Raven, Michael Webb, John Budden and Adrian Rawlins gave me the groundwork of knowledge on which I have depended ever since, with the emphasis on the Classics, the Scriptures, British history, political geography, English literature and French, all subjects that are more or less sidelined in modern schools. For good or ill, Tormore has made me the man I am today. For details of my book, Sherborne St John and The Vyne in the Time of Jane Austen, please refer to my ‘Books’ page. The Vyne now has an individual website which includes a note about Tormore and a link to this page (click on ‘Things to see and do’, then ‘The House’) – http://beta.nationaltrust.org.uk/vyne.